I recently conducted a nature journaling gig at a local outdoor gear store, the sort of business that sells tents and kayaks and attracts the hiking boots-and- Birkenstocks crowd. Although I don't make a single reference to God in my workshops, I've discovered nature journaling is a clear invitation to the spiritual life. Preach the gospel of paying attention, and you discover that few people can be in creation for long without plumbing nature for what's behind it all. When you learn to love the natural world, you begin to wonder where to direct your gratitude. You start asking questions. 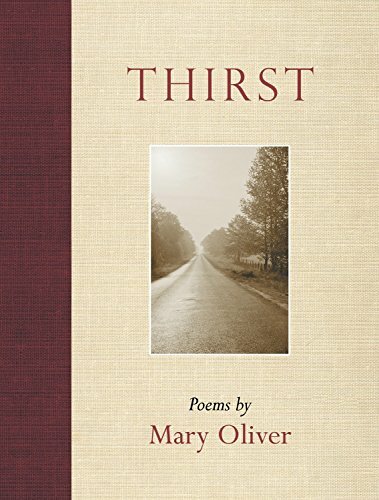 Thirst, the poet Mary Oliver's newest collection, is the outflow of a life lived preaching the gospel of paying attention, with all of the gratitude and questions this might imply. In Thirst, this attention comes into sharp focus on God as the creator. "Love for the earth and love for you are having such a long conversation in my heart," she compellingly writes in the title poem. With its many references to faith, especially in three long poems—"Six Recognitions of the Lord," "More Beautiful than the Honey Locust Tree Are the Words of the Lord," and "On Thy Wondrous Works I Will Meditate"—Thirst is the most explicitly Christian "conversation" of Oliver's 15 books of poetry. Those of us who plunk down money for every slim, pricey Oliver book that hits the shelves know that her observations have always vibrated with the spiritual. "Understand, I am always trying to figure out / what the soul is" she writes in "Bone" from 2004's Why I Wake Early. In House of Light's "The Summer's Day" she reflects, "I don't know exactly what a prayer is / I do know how to pay attention." With "Prayer," one of the Thirst's most inviting poems, she takes these lines a step further: "just / pay attention, then patch / a few words together and don't try / to make them elaborate, this isn't / a contest but the doorway / into thanks, and a silence in which / another voice may speak." Her life of attention is a prayer itself, born of an intense contemplation of creation. "My work is loving the world," she writes in "Messenger." This love spills over into a passionate desire for us to share with her in the beauty of creation. "Have you noticed?" she asks, a trademark Oliver rhetorical question. Do we see the cormorants, "a muddle of birds / black and spiky, / long-necked, slippery"? Do we notice the moth slipping from the cocoon; "He is beautiful now, and shivers into the air." Or the otter, which "breathes in descent trailing sudden / strings of pearls." Like the best sort of evangelist, Oliver wants us to share in these delights with her. It was her passion for paying attention that helped Oliver win the Pulitzer Prize for poetry (American Primitive) and the National Book Award (New & Selected Poems). "To pay attention, this is our endless and proper work" she writes in "Yes! No!" from White Pine. In Long Life, she notes that "writing poems, for me . . . is a way of offering praise to the world." Again, Thirst takes this a step further, directing that praise toward the one who created it all: "Every summer the lilies rise / and open their white hands until they almost / cover the black waters of the pond. And I give / thanks but it does not seem like adequate thanks / it doesn't seem / festive enough or constant enough, nor does the / name of the Lord or the words of thanksgiving come / into it often enough" ("Six Recognitions of the Lord"). Her gratitude is anchored in an awareness of her mortality. In "Messenger," she marvels at her increasing age (she recently turned 71): "Are my boots old? Is my coat torn? Am I no longer young, and still not half-perfect ?" In "Cormorants" she asks, "God, how did it ever come to you to / invent Time?" Oliver has never been afraid to wrestle with the idea of dying; think of the poignant "When Death Comes" (New & Selected) and the metaphorical "White Owl Flies in and Out of the Field" (House of Light). In Thirst's "Six Recognitions of the Lord," one of the three long poems on the Christian faith, she rows her "beautiful, temporary body / through this water-lily world." These three long poems are a modern-day Psalter. "Lord, when I sleep I feel you near. / When I wake, and you are already wiping the stars away, / I rise quickly, hoping to be like your wild child / the rose, the honey-maker the honey-vine; / a bird shouting its joy as it floats / through the gift you have given us: another day" ("More Beautiful than the Honey Locust Tree Are the Words of the Lord"). Threading through Thirst is a wrenching sense of loss and grief, reflecting the death of her longtime companion Molly Malone Cook in 2005. With this comes relinquishment, a resounding theme in Thirst: "Everything is His / The door, the door jamb. / The wood stacked near the door" (from "Musical Notation: 2"). Oliver's book finishes with the title prose poem "Thirst," in which she steadfastly faces the future: "Who knows what will finally happen or where I will be sent, yet already I have given a great many things away, expecting to be told to pack nothing, except the prayers which, with this thirst, I am slowly learning."